Thanks a bunch to MBS Textbook Exchange for the free ham! Here's something that happens when you're a store that sells lots of textbooks: the wholesalers that sell textbooks to you will send you little gifts now and again. We used to get like, barrels of caramel popcorn. MBS? They sent us a 10-pound frozen ham. They've done it the last few years we've been here, and we've always been super excited to get it. Time to start planning our annual ham party. 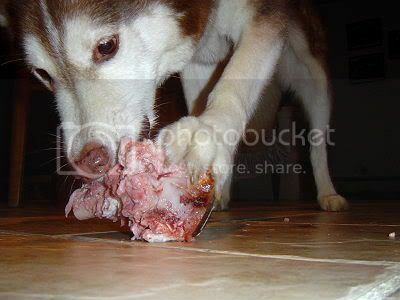 My siberian husky, pictured here, would also like to offer his profound thanks and gratitude to MBS for all the bones they've provided over the years.